Greg Keller and Maria Dizzia. Photo by Sara Krulwich, The New York Times. I remember reading, as a twenty-something, general consumption reviews of the “capture the zeitgeist” television hour-long dramedy 30something as whiney, self-involved, pampered adult kids who just need to grow up and get a life already. I pushed those evaluations aside at the time because those reviewers were trashing a weekly soap opera with nicely crafted arcs that I loved. Of course I aspired to aspects of the lives portrayed. I was in a midwestern college town in a graduate program that was didn’t match my real interests and I looked to these characters who lived in a larger city (points) on the Eastern seaboard (more points), living in lofts or cool houses or rambling apartments, and having complicated and involved lives losing and gaining jobs, deciding to have children, having affairs, getting divorced. Living. Such drama informs but does not frame the two-act, two-apartment, two-couple superficial treatment of postponed adulthood, postponed parenthood, troubled couplehood presented at City Center in Daniel Goldfarb‘s Cradle and All. Playwright Goldfarb places procreation center stage, and all other life decisions on the periphery, and everything comes out superficially addressed. On the one side of the hall the older woman (by five key childbearing years — 34 versus 39, that we soon learn has been rounded down) in a five-year connected couple talks around, then addresses dead on the subject of possible parenthood. Claire (Maria Dizzia) was a B-movie actress who then adolescent Luke (Greg Keller) saw on television in her one big (bad) movie, and indulged masturbatory fantasies (yes we hear about them) by meeting her, then bedding her, then coupling with her in a Brooklyn apartment. We don’t know what she does for a living now; we do know that he (now in his mid 30s) is working for a rich uncle in the antique business. He doesn’t want to move on from their childless state; we and Luke learn in this late night conversation of an old choice she once made (and unbelievable that she never mentioned this fact before) that enhances her desire for a child now. 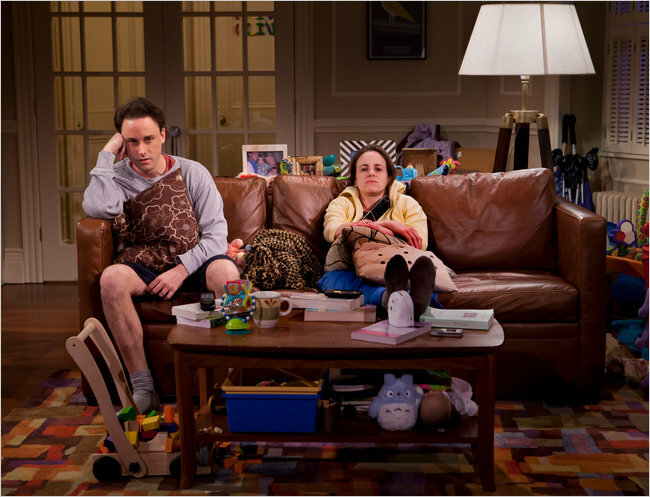 On the other side of the hall in the second act, we are introduced in an identical yet flipped and toy-strewn apartment to Annie (Maria Dizzia again) and Nate (Greg Keller again), parents of a constantly crying 11 month old. These cries attract the childless and traumatize the new parents. The beautiful apartments, the lovely clothes, the references to one of the partners in each household not working for years (and they’re both actors) bring up the old 30something critique for me. Set design by Neil Patel creates a world we’d want to live in. Props capture the different worlds: childless Claire purchases twelve dozen red roses and strews petals around the room for an ill-conceived (and ineffectual) stab at romance; Annie and Nate navigate among their child’s belongings and barely tidy the overwhelmingly toy populated apartment across the hall. But when mommy Annie at the end of her rope, after hours of therapist-encouraged “let her cry herself to sleep” advice online, and who is now (I supposed we are to gather) deciding to standing in her own strength and make her own decisions to parent her own way, calls that same therapist a c*nt after an unbelievable set of instructions by the therapist to the parents (don’t clean the infant up after she’s been sick, show her who’s boss and she won’t do it again), my sympathies for any of the characters on stage and for the playwright himself finally left the building.